News of the unrest seems to have moved off the front pages of national newspapers, but the crisis, far from retreating, has in fact deepened. “I walked for nearly 14 km to get access to internet from Sikkim, our neighbouring state. That’s how I could mail you now,” wrote Brihat Rai, a Kalimpong-based photographer who has been chronicling the ongoing crisis in the Darjeeling hills. On July 15, he sent The Wire his photo essay, highlighting the region’s struggle for separate statehood. His mail reflected the lack of connectivity that has left Darjeeling paralysed for the last 46 days. As the struggle continues unabated, locals have had to endure a month of virtual darkness – internet services were suspended 41 days ago and mobile networks have been erratic. Incessant rains have damaged electric poles, with most parts of the region witnessing power outages as well. News of the unrest seems to have moved off the front pages of national newspapers, but the crisis, far from retreating, has in fact deepened. On July 30, a global rally was held in support of the Gorkhaland movement in over 100 locations, including Afghanistan, Australia and 15 places in the US. Protesters march in Darjeeling on July 30 as part of the Global Gorkhaland Unity March. Credit: Upendra Pradhan. “Even the people who have left their homes over a decade ago and settled in other parts of the country and the world, want Gorkhaland. They feel the future of the hills is not secure in the state,” said political analyst and Darjeeling resident Upendra M. Pradhan. It had taken four days to contact him on his mobile phone. Pradhan believes the protests have become a celebration of the region’s unity. “Every day there are different forms of protest. One day there was a kalam rally, where participants carried pens in their hands. Then there was traditional dress rally where everyone wore their respective community’s costumes. One day it was a musical rally, another day a khukri rally and some days it is a rally with black flags. This is a celebration of our unity,” he said. According to him, the rallies, which were started by the Gorkha Janmukti Morcha (GJM), do not just represent political interests now. They have translated into something larger and have become a ‘people’s movement’ in which everybody is demanding their right to Article 3 of the constitution that allows the formation of new states. Other political parties like the Gorkha National Liberation Front (GNLF) and the Communist Party of Revolutionary Marxists have also joined the struggle. 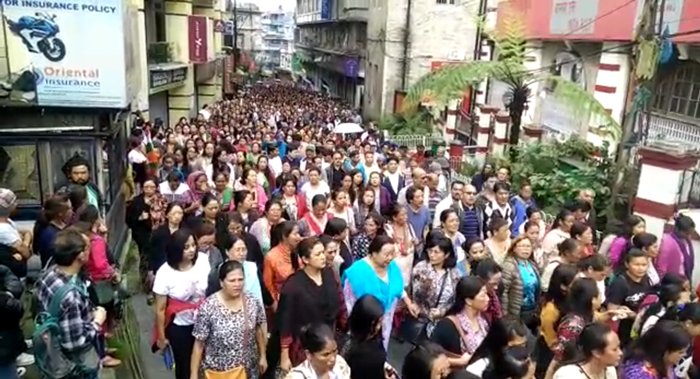 On June 17, the GJM called on all the youth in the hills to march to Patlebas, where the party office and chief Bimal Gurung’s residence are located, to protest the raids that had been conducted there on June 15. A day before the march, on June 16, 600 CRPF personnel deployed by the Centre, had reached the hills. When the rally was making its way to Patlebas, they were stopped by the forces and the police in Singamari and Ghoom, and clashes broke out. “The protesters were marching towards Patlebas when the police confronted them and clashes broke out. The police shot dead three GJM supporters,” Pradhan said. GJM assistant general secretary Binay Tamang confirmed the deaths in a statement to PTI. The police, however, denied opening fire. The day after the Patlebas incident, protesters gathered in thousands but the police were nowhere to be seen. The protesters were not stopped that day, there were no clashes, not a single bullet was fired and not a single stone was thrown, Pradhan said, explaining that on the other days, the violence had been instigated. Pradhan said a total of nine civilians have died so far – eight of whom have been killed by the forces. To make things worse, people believe West Bengal Chief Minister Mamata Banerjee has not been allowing rations and medicines to reach the hills. Pradhan, however, said the people are okay with this – they don’t want ration from the Bengal government. 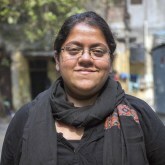 Banerjee has made her intentions more than clear, he said, that if rations are to be sent up, then peace has to be restored, and her idea of doing that is by using force. Ration is not the only cause of concern – the youth’s future is at stake, as the lack of connectivity made it impossible for students to apply to colleges. The internet ban was imposed in Darjeeling at a time when students who had finished their 12th standard board exams were to fill up college admission forms. A number of students were unable to do so because the deadlines have passed. “Lots of students are going to lose a year now unless local colleges somehow accommodate all of them,” Pradhan said. Schools have been closed for over a month now and it is unlikely that the syllabus will be completed in time for their exams. Some people have got together to hold classes for students but this too is not regular since Section 144 of the CrPC, which prohibits the assembly of more than four people in an area, is imposed in parts of Darjeeling. The presence of paramilitary forces in the hills has led to a drastic transformation – what was once serene, is now a strife-torn region. “Darjeeling is unrecognisable now. People are scared to move around after dark because there are forces with guns everywhere and we don’t know when who will question us about where we are going. Earlier everybody would be out at night, but now, people don’t go out after 6-7 pm. There are CRPF people everywhere standing with guns. We are intimidated,” said Parjanya Sen, academician and a resident of Darjeeling, who has been present at most protests that have taken place. It took a week to get in touch with him on his mobile number. In the month between June 16 and July 17, the Centre sent troops to the hills four times – initially six companies, then four, followed by two each on July 16 and 17, after Banerjee’s government wrote to the Centre asking for more forces to contain the situation. An official from the state’s home department on July 17 told PTI that the raids would continue and law and order situations would be dealt with in a tough manner. “Raids will continue. In fact, there will be raids tonight on the basis of our intelligence inputs,” Sen said. 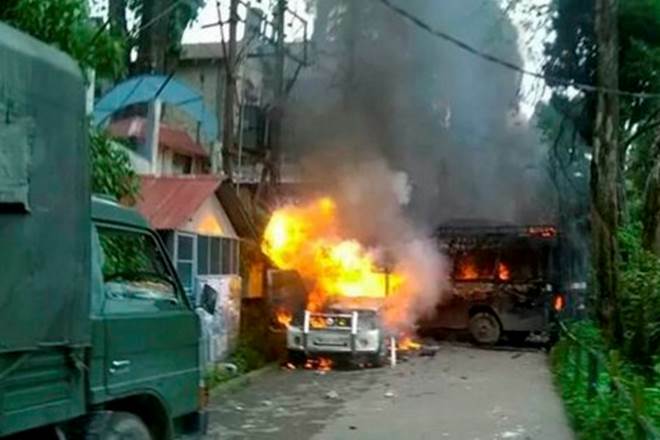 In Siliguri, hill people who were trying to bring rations to Darjeeling are being attacked and looted. “Trucks are not being allowed to come up to the hills from below. For food we are going barter. If someone grows vegetables or has managed to get some meat, then they are sharing, that is how we are managing,” said Sen.
On July 20, the bank accounts of Gurung, Tamang and GJM general secretary Roshan Giri were frozen by the West Bengal CID for the alleged “misuse” of funds for “illegal operations such as purchasing arms and weapons”. A CID officer told PTI that around Rs 26 lakh had been seized from the three accounts and it wasn’t clear until when the accounts would remain frozen. Pradhan explained that the situation now is such that when the Gorkhaland Movement Coordination Committee – an organisation that leads and gives direction to the movement, and has political party leaders, non political thinkers and academics as members – holds a meeting in the hills, thousands of people gather outside and tell them that if they call off the strike then there will be trouble. By continuing the strike, they hope they can get the central and state governments to address the issue. S.S. Ahluwalia, the BJP member of parliament from Darjeeling and the party’s national vice president, at a press conference on June 20 reiterated the BJP’s 2014 election manifesto promise that it would “sympathetically examine and appropriately consider the long-pending demands of the Gorkhas, Adivasis and other people of Darjeeling”. Ahluwalia also said that the firing on unarmed civilians was “unpardonable”, calling for a “high-level” probe into the incident where three civilians had died. He has however not said anything since. The GNLF on July 21 filed a missing diary with the police on the MP for his absence from his constituency at this time of turmoil. 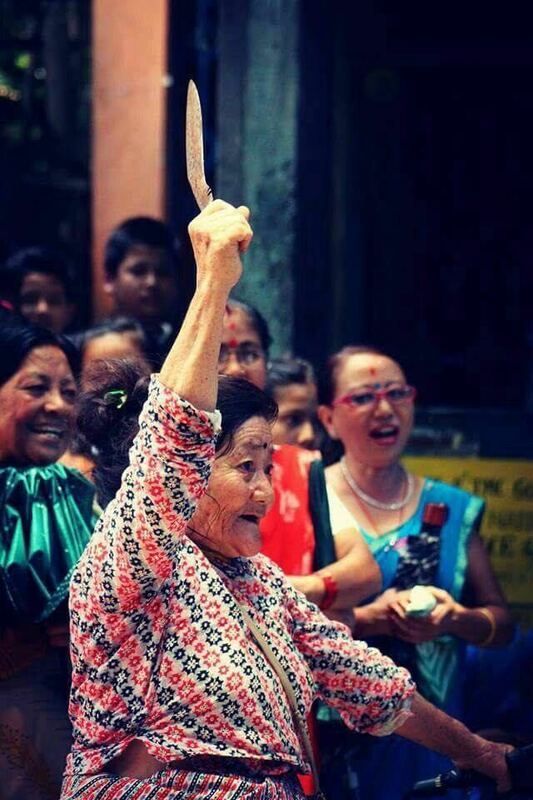 Although the demand for statehood in the hills goes back generations, the current crisis began on May 15. The Darjeeling municipal elections were held on May 14 and the day after that, state education minister Partha Chatterjee announced the ‘three language policy’ – the compulsorily study of Bengali by students between class 1 and class 10 in addition to two other languages. On May 16, Banerjee detailed the policy via a Facebook post, saying that students could opt for English, Nepali, Urdu, Hindi or any language as the other two to study, but one of three languages would have to be Bengali. Apart from the Gorkhas, there are other minorities in the hills as well. In the hill demography, the Gorkhas are 35%, Rajbangsis 25%, Adivasis 20%, Bengalis 15%, and Totos, Mech and others are 5%. “A lot of students have anyway always opted for Bengali, sometimes even as their second language. There was no need to make it compulsory. Bengali is not our mother tongue, so generally what we learn is Nepali, English and as third language we choose Hindi, because it is widely used and more or less a national language,” said Pradhan. Following the announcement of the policy, various academics from the hills – Sahitya Akademi award winners, school principals and headmasters – held a seminar to discuss the implications and viability of it. The event had about 12 speakers and was attended by around 500 people. The speakers that day concluded that although learning a new language is good, making the study of one compulsory did not make sense. The day after the seminar, the district administration filed FIRs against the speakers, for ‘spreading communal disharmony’. Among those against whom a FIR was filed was Reverend Joy Haldar, principal of St. Paul’s school, who is Bengali. “The high handedness shown by the district administration’s move to file FIRs was a big trigger. People were angry because they could not even protest the imposition of a policy that could directly impact them,” Pradhan said. On June 8, Banerjee held a cabinet meeting in Raj Bhavan in the centre of Darjeeling. The police, fearing protests, stopped vehicles coming into town from the outskirts. “The meeting was to be at 7 am and the police thought that protesters will be coming in vehicles, so they stopped all of them. ‘Chaabi cheen liya’ is what the drivers said. But in those vehicles were students from the outskirts – they were coming to town for their school and many of those children had their half-yearly exams going on,” Pradhan said. About 300 metres from the Raj Bhavan is the Bhanu Bhawan, the building that holds the office of the GTA and where the protesters had gathered that day to burn effigies of the chief minister. Sen was present at the protests. “When I went to offer khada (pay respect) to those who had been killed in the protests that day, the faces of three of the youth were mutilated. I saw one of them myself, his ear and nose were gone,” Sen said. As per national and international laws, even in extreme cases of violence – which was not the case, because those who were shot down were young boys who had only slingshots in their hands – people are supposed to be shot in the legs, he said. The following day, on June 9, the state administration sealed off Bhanu Bhawan. “GJM called for a day-long strike on June 9 and that day the administration started arresting GJM leaders, including 65-year-old Ghumaya Gurung, and they sealed off Bhanu Bhawan, where the office of the GTA is, and that is a constitutionally formed body, it cannot just be locked down,” said Pradhan. 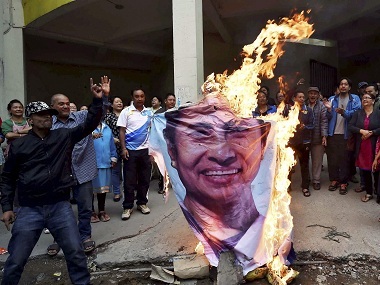 Other than GJM, six hill parties, including TMC ally GNLF – which broke its alliance with the ruling party – had extended their support to the movement and passed a resolution on June 13 in favour of creating a new state. Of the five members of the legislative assembly from the region, two are from the GJM, two from the Congress and one from the CPM. The Darjeeling municipality chairman is also from GJM. 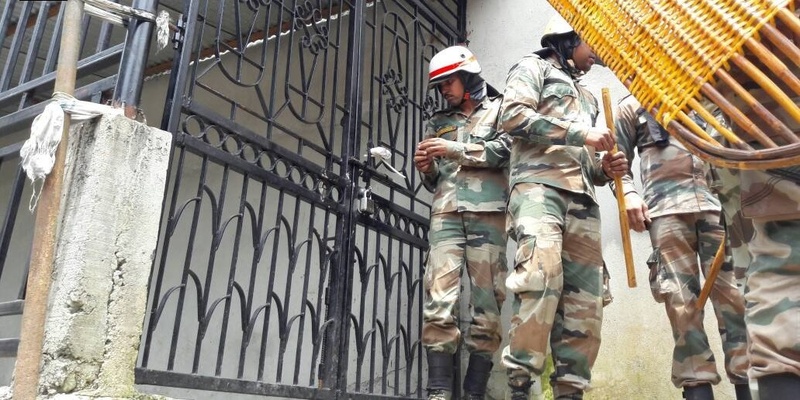 On June 15, the GJM party office was raided and sealed off. The police said they recovered 300-400 weapons, including arrows and explosives in raids on the premises. He went on to say that the GJM was being targeted for their fight for a separate state, and that the police and the state government were filing false cases against them. He also said that the present crisis in Darjeeling had been created by the state government that is trying to suppress the movement by using force. Following the raids, the GJM central committee called an indefinite shutdown in Darjeeling. Both Pradhan and Sen spoke of an incident they heard had taken place on July 7. A 30-year-old man was out to buy medicines at night in Sonada and he was shot dead by the CRPF. When word spread about this, the next day protesters burnt a traffic assistant booth in Sonada, there was shelling, lathi charge and tear gas firing at the crowds that day, Pradhan said, adding that since CRPF had been diverted to Sonada that day, the number of protesters in the main town were larger than the forces and they torched and overturned a police vehicle. The police retaliated and two protesters died that day, he said. “When protesters started being killed in clashes, it became like an emergency situation here. Things were so convoluted that TV channels in Kolkata were showing videos on the screen of the police firing, but the anchor was saying ‘the police have said they did not fire a single bullet’,” said Pradhan. After the Patlebas incident on June 17, the district administration filed cases against GJM leaders saying that the firing was done by the party cadres themselves to show the police in poor light, Pradhan said. There is footage showing that the police fired and the protesters retaliated, throwing stones, bottles and other things they could find around them. “If you see your friends dying in front of your eyes, you will retaliate,” he said. “On that day (June 17), three people died but over 50 were injured – many of them with bullet injuries. People with bullet injuries, fearing the Bengal government, did not go to government hospitals in the state, they chose to go to hospitals in Sikkim. People don’t trust the government,” he said. 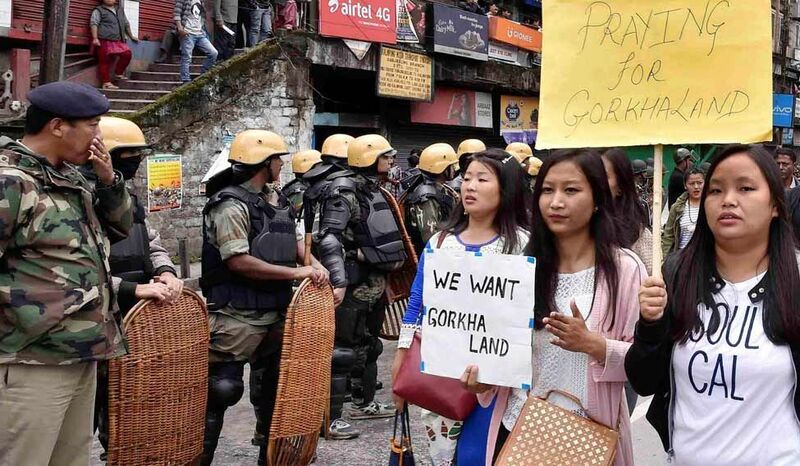 From that day onward, thousands have been rallying on the streets in Darjeeling, Kurseong, Kalimpong and Mirik every day, with no intention of calling off the protests. Thirteen members of the GJM Yuva Morcha started an indefinite hunger strike on July 21 in Darjeeling, Kalimpong, Kurseong and Sonada. GJM Yuva Morcha president Prakash Gurung told PTI that the number of people on hunger strike would increase gradually, “We will continue our fight till Gorkhaland is achieved,” he said. Pradhan said he is worried about those on hunger strike, their health has been deteriorating. “Mamata used to say ‘pahad haschhe, pahad haschhe’ but jokhon pahar kadchhe tokhon tumi kothaye? (Mamata used to say ‘the hills are smiling, the hills are smiling’ but where are you now when the hills are crying? ),” he said.